Super Absorbent Polymers are found in many places around the home. Beads grow quickly over the first few hours if swallowed and could block the intestines of a child. Always supervise children while playing with super absorbent polymers. Super Absorbent Polymer (SAP) balls and beads are used in many ways around the home. They can be found in flower arrangements to hold stems in place, in gardening to keep potting soil from clumping, disposable diapers to wick and hold urine, and as toys. WHAT CAN HAPPEN IF SWALLOWED? Small dry beads may look like candy and can be easily swallowed by children. Once ingested and as they come in contact with stomach juices, the beads grow quickly over the first few hours. They can grow many times their original size to become large bouncy, squishy balls. Even though the material that the balls are made of is non-toxic, larger balls can cause harm by blocking the small intestines of a child, if eaten. Dry beads can vary in size. Those that are smaller than a pea to begin with are not expected to cause a blockage, although they may cause minor stomach upset when eaten. 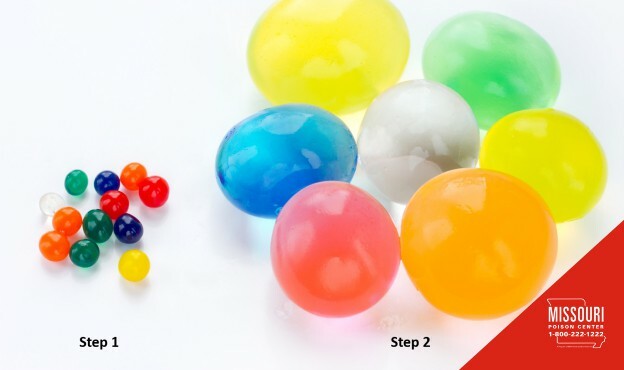 The picture o n the right shows how dry larger balls to begin with (step 1), can get bigger in size after added to liquids (step 2). Dry balls that are half the diameter of a dime or larger, can swell to a size that could potentially block the small intestines of a child. Symptoms of blockage are repeated vomiting, swelling and/or pain in the area of the stomach. There is also danger that balls can be aspirated into the lungs during ingestion. This is can cause coughing, wheezing, or difficulty breathing. To prevent ingestion in small children the Missouri Poison Center advises adult supervision of children playing with super absorbent polymer balls. For any questions or concerns about super absorbent polymer balls, call the Poison Help line at 1-800-222-1222. Specially trained nurses and pharmacists are available 24/7/365 to answer your questions. The service is free and confidential.